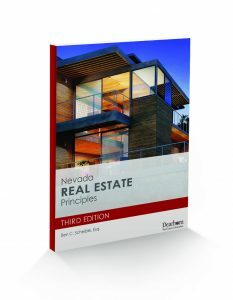 This comprehensive textbook provides an essential introduction to the principles guiding the real estate industry in Nevada. Updated with the latest Nevada Revised Statutes, as well as general real estate law, this book covers a variety of prelicensing topics. The latest edition includes federal closing and disclosure laws, Nevada license exemptions, education requirements, and composition of the Real Estate Commission. Extensive illustrations, figures, and forms clarify key concepts, while “For Example” and “In Practice” sections offer real-world applications to classroom principles. Includes chapter quiz questions that mimic the Nevada Real Estate Licensing Exam, as well as a classroom final exam.